A while ago, I purchased a vintage manual for the Bridgestone 90 and 175 on Ebay from a chap in Australia. It's no secret that I love old things. Sorry, I meant 'vintage' things. This includes bikes (obviously) clothes, books, music, etc. This is nothing new, I grew up excited to visit thrift stores and garage sales looking for undiscovered treasure. 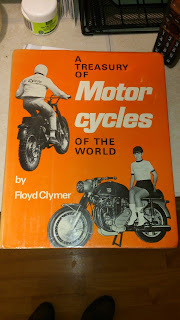 As it turned out, this was an old Clymer manual from the late 60's in very nice shape. I didn't pay much, once again shipping being more than the item itself! 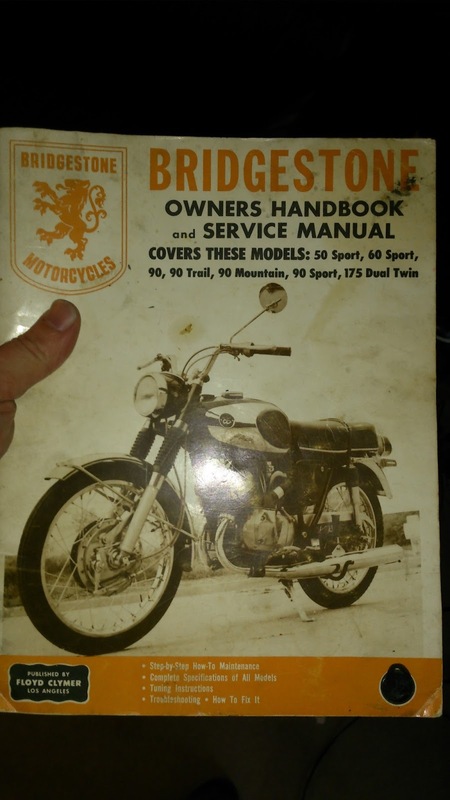 I have every conceivable Bridgestone manual produced on PDF, however I need to have something in my hand when I am working. This is partially due to having a poor short term memory and also hauling a laptop around the garage seems like a recipe for disaster. 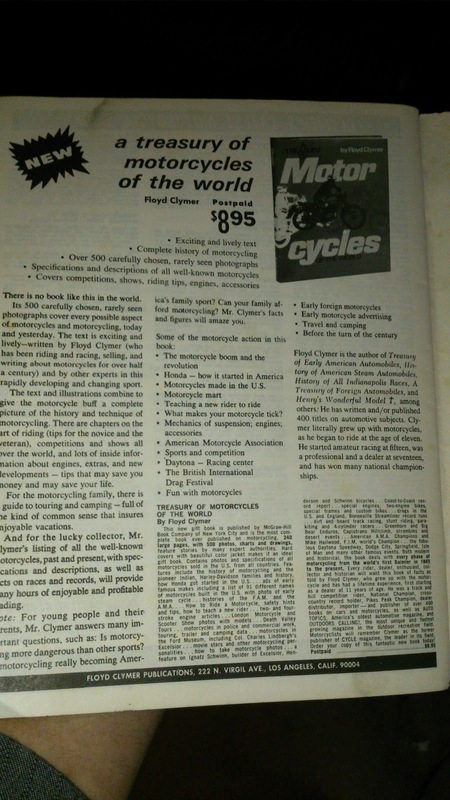 As I flipped through, I spied adverts for other manuals and books advertised in the back pages. $8.95? 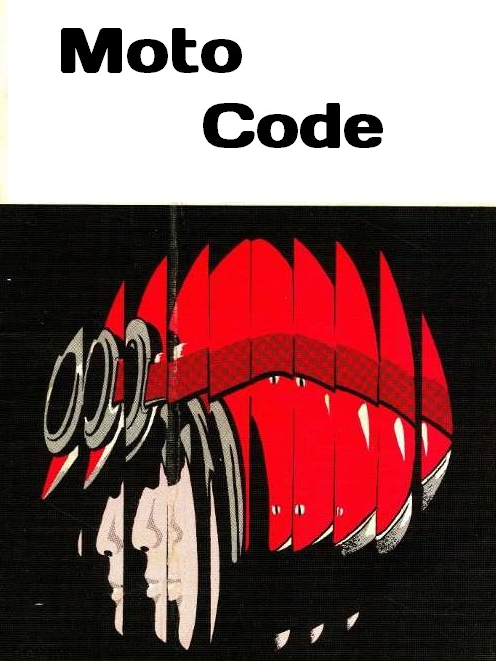 Considering that contemporary manuals were around $3.95 or less, this was quite a sum for a book in 1969. My curiosity got the best of me so I started hunting for any existing copies. I found a few, mostly for ridiculous sums (in the stratosphere of $60.00 to $100.00!~) which left me unimpressed. I looked around a little more and found that Goodwill in the states has an incredible selection of used books online on Ebay. For a much more reasonable $4.00 (plus $11.00 shipping, naturally) I took the plunge. 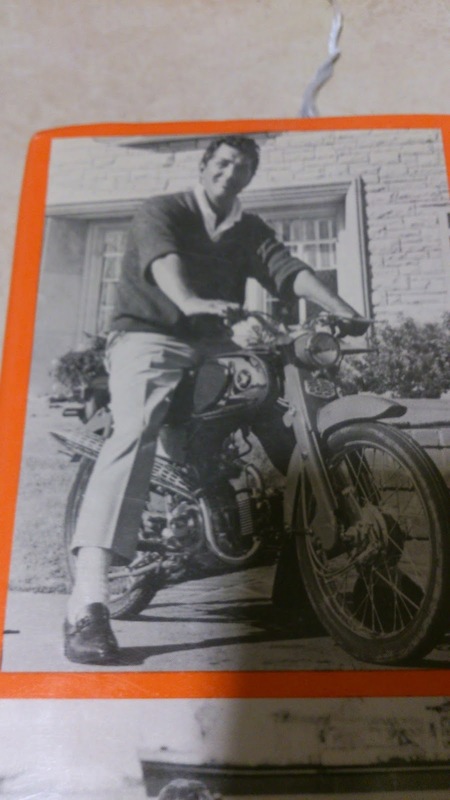 You have to love any book that has a picture of Dean Martin on the back riding a small Honda! This is actually an excellent read, with thorough articles about how to teach someone how to ride, camping on two wheels and an exciting craze called 'Para-Kiting' . In case you were wondering, this involves riding in the desert while someone wearing a parachute is dragged behind! Apart from the odd fads, this tome covers racing, scrambling lots and lots of history as well as models of bikes that are scarcely seen today (Parilla Wildcat Scrambler anyone?) It was evident that Floyd Clymer was deeply passionate about motorcycles, I would guess that this book was purely a labour of love. 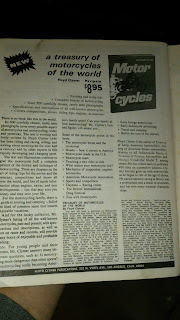 At the very least a love letter to motorcycling. If you can find one, get it....I am saving the remaining chapters for winter reading. In other news, I am waiting on my NOS Dual Twin cylinder to arrive in the mail. I hope it gets here soon so I can get this engine back together! I also managed to find a suitable replacement battery for the Bridgestone(s). This was at www.batterystuff.com after getting very little help from local retailers. One bike shop wouldn't even check for me unless I brought the old battery in! This, despite having the measurements on hand (what would he have said if I didn't still have an original battery? I should have hung up, called back and found out using a fake accent) Were his measurements somehow more accurate than mine? Did he possess some variety of magic tape measure only available to motorcycle shops? I digress, however Gandalf won't be getting my business again anytime soon. For a mere $30.00 (plus $20.00 for shipping...less for once!) One can buy a sealed gel battery ready to run. I am expecting this shortly and will let you know how it works.